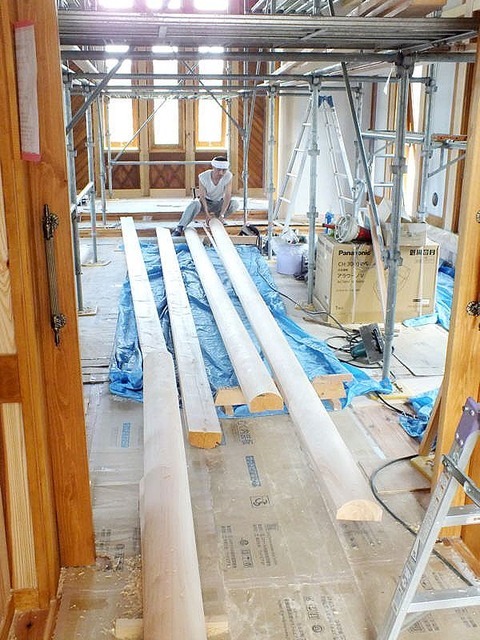 紀州檜の香る教会　本宮教会　ワイツー設計（株）のブログ　The diary of the construction work in the Fukushima Motomiya Church.The blog of Y two design Inc. : ０１９　内外装工事、進行中　その７！ The construction is in progress eagerly! The 7! 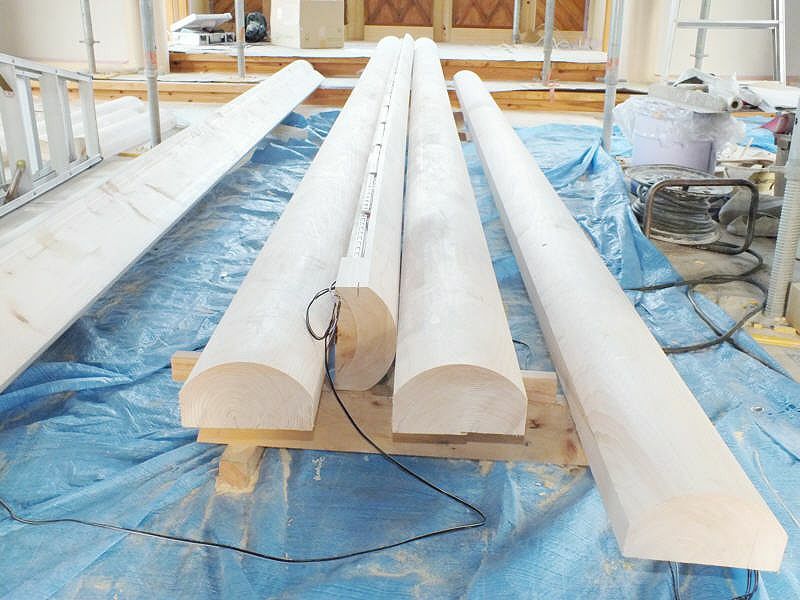 紀州檜の香る教会　本宮教会　ワイツー設計（株）のブログ　The diary of the construction work in the Fukushima Motomiya Church.The blog of Y two design Inc.
< ０１８　内外装工事、進行中　その６！　The construction is in progress eagerly! The 6! ０１９　内外装工事、進行中　その７！ The construction is in progress eagerly! The 7! The construction is in progress eagerly! The 7! Yasunobu Ui from Y two Architectural design company. The pillar for the ordered decorations arrived at the building site. As for the pillar of this Japanese cypress, the length is 6 meters. It is a Japanese cypress in Yoshino district in Nara Prefecture. It shaves and it makes circular. The carpenter investigates one one and installs. 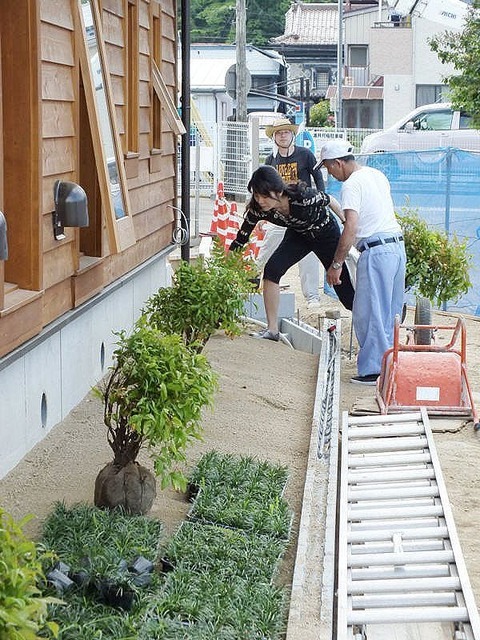 Omata Yoko architect indicates the plan of the garden plant construction. It adjusts each of the building construction, the outside appearance construction and the garden plant construction and finding the best balance thinks one of the work of the architect. ０２１　もうすぐ竣工！ It is soon completed! ０２０　内外装工事いよいよ終盤！　The construction approached a　final proces. ０１８　内外装工事、進行中　その６！　The construction is in progress eagerly! The 6! ０１７　内外装工事、進行中　その５！　The construction is in progress eagerly! The 5! ０１５　内外装工事、進行中　その３！　The construction is in progress eagerly! The 3! ０１４　内外装工事、進行中　その２！　The construction is in progress eagerly! The 2!